Clockspot allows employees to clock in from any cell phone or landline by dialing a toll-free number. This allows employees to track their time without the need for internet or a smart phone. 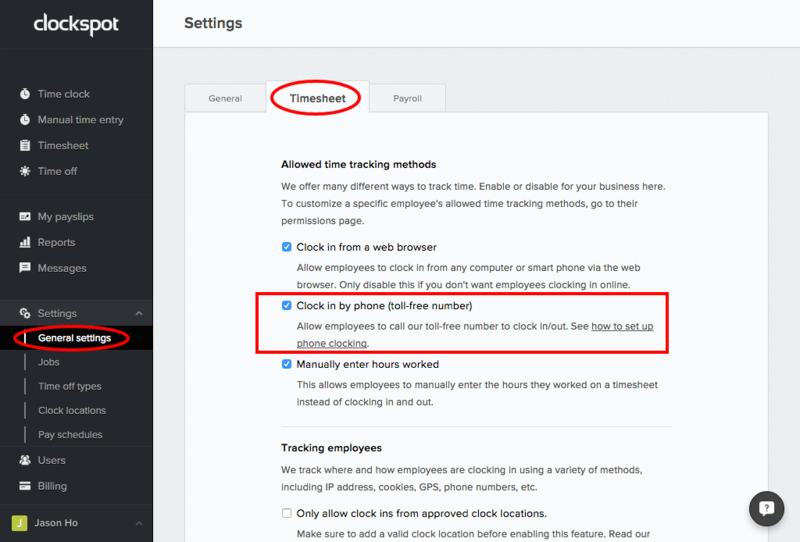 To use this feature, first enable this time tracking method by going to Settings > Timesheet tab, then checking “Clock in by phone (toll-free number)” under “Allowed time tracking methods”. This tells Clockspot you will be using this feature and to show all options related to it. Once enabled, you will see the option to “Enable phone clocking” when you go to add a new user. Check this to generate a random phone user ID for that user to clock in with. You will also be prompted to enter a PIN number for that user. If you’ve already added users before enabling the phone clocking feature, you must go to each individual user’s settings (Users > Choose a user > Settings tab) and check “Enable phone clocking”. Enable “Clock in by phone (toll-free number)” in Settings > Timesheet tab. Check “Enable phone clocking” in Users > Choose a user > Settings tab, if you haven’t already. Check to see that the user has a phone user ID and PIN. You can see this when you go to the user’s profile.